Unlike the wide open spaces of the western United States and Canada, you will normally drive only a few hours to your next destination in New England. Driving your own vehicle or a rental car around New England gives you the freedom to go anywhere, whenever you want. Driving is usually more time-efficient than using public transportation in a relatively compact region such as New England. On most two-lane roads the maximum speed limit is 55 miles per hour (mph; 89 kph). 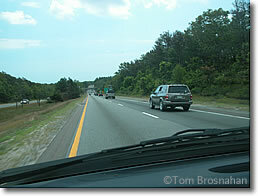 On four-lane Interstate and similar highways, speed limits vary from 55 mph (89 kph) to 70 mph (113 kph). Traffic often moves at speeds several miles per hour above the legal limit. Although police patrols often allow this, a driver exceeding the speed limit is always liable to be fined for exceeding the limit, even if everyone else is as well. Control of drivers' speed on highways is predominantly controlled by local and state police mobile patrols (officers in police patrol cars) and radar traps—officers concealed from view who monitor speeds with radar equipment and stop and fine drivers for exceeding speed limits. Unmanned speed cameras are rare. Fines can be substantial, several hundred dollars per incident. Some Interstate highways and expressways are subject to tolls. Payment is either by toll-ticket taken at the entrance to the highway, and surrendered and paid at the exit from it; or by toll booths located at several points along a highway that accept cash payments, usually in coins. Toll booths staffed by humans are being phased out. The E-ZPass electronic RFID transponder, placed on a vehicle windshield, communicates with toll-tracking transceivers at toll stations to record toll transactions. It is used throughout New England, New York, south to North Carolina and west to Illinois. Vehicles equipped with E-ZPass transponders may pass through toll stations without stopping, in some cases even without slowing down to pass through the toll station. Each state has its own E-ZPass program. To use E-ZPass, you must register and purchase a transponder. Here's how to do it for Massachusetts. Unleaded gasoline (petrol) with (R+M)/2 octane ratings of 87 to 92 and perhaps 93, and clean diesel (ultr- low-sulfur diesel) motor fuels are easily found in New England, with plenty of fuel stations in cities, towns, villages and on highways. Prices vary from station to station and state to state because of prices set and state taxes levied. Diesel fuel is usually more expensive than gasoline. Fuel dispensed is measured in US gallons. One US gallon = 3.78541 liters, or 0.832674 imperial (UK) gallon. Most fuel stations have self-service fuel pumps: insert your credit or debit card into the pump, put the fuel hose nozzle into th fuel filler tube of your vehicle and pump your own. You can always pay in cash for your fuel if you prefer. A small number of stations may have full service pumps at which an attendant will pump the fuel for you, usually for a slightly higher price. If you have trouble with fueling you can always ask an attendant for assistance, even at self-service pumps. In city centers, street parking is usually controlled by parking meters or parking ticket stations. Parking lots, though in some cases expensive, are the best option for longer (2+ hours) parking sessions. At busy transportation termini such as airports, bus terminals, ferryboat docks, etc., parking can be strictly regulated. If, for example, you plan to drive to Hyannis MA, park your car and take a passenger ferryboat to Nantucket Island in the summertime, you should reserve both your place on the ferry and your parking space at the dock in Hyannis. You may not be able to find another legal parking space near the docks.